He had an appointment at the Saudi consulate in Istanbul to collect some documents he needed to marry his Turkish fiancee -- a certificate showing that he was divorced from his first wife. He entered the consulate on Oct. 2 at 1:14 p.m., asking his fiancee to wait outside for him. She did. Until 2 a.m. He never emerged. The story is making headlines around the world. Murder and possible dismemberment in a diplomatic facility will do that. President Donald Trump, who has forged very close ties with Crown Prince Mohammed bin Salman, has described it as "a very sad situation." Trump continued: "It's a very bad situation. We cannot let this happen, to reporters, to anybody." 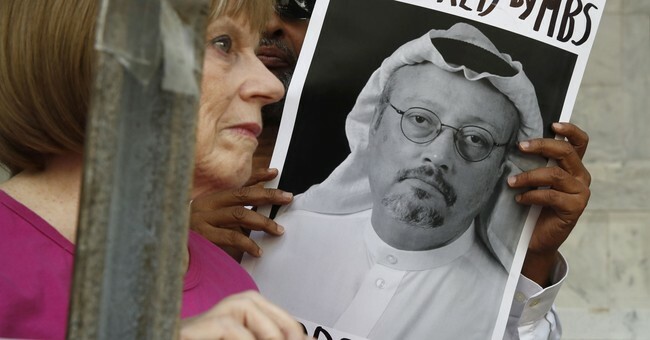 If, as looks very likely, Khashoggi was kidnapped and murdered on the orders of the crown prince, it should be a cautionary tale for his overly enthusiastic fans in the West. Just six months ago, the 33-year-old spent three weeks in the U.S. meeting leaders of business and government. In addition to an Oval Office session, he met Hollywood bigwigs Morgan Freeman, James Coleman and Dwayne "The Rock" Johnson. CBS's "60 Minutes" hailed Mohammed bin Salman as a "revolutionary" who was emancipating women. He was received by Bill Clinton, Oprah Winfrey, Rupert Murdoch and Stephen Schwarzman of the Blackstone Group. Jared Kushner reportedly felt that the two young scions understood one another, and helped persuade Trump to make Saudi Arabia his first foreign destination. But Crown Prince Mohammed's nods in the direction of reform -- he has permitted movie theaters to open for the first time in decades, and women now have the right to drive (at least in theory) -- shouldn't cause hearts to flutter. The history of western wishful thinking about "reformist" dictators is very, very long and nearly always ends in tears. After Leonid Brezhnev died, the American press was suddenly enamored of former KGB head Yuri Andropov. He spoke English! He "relaxed with American novels." The Washington Post reported that he "is fond of cynical political jokes with an antiregime twist ... collects abstract art, likes jazz and Gypsy music," and "has a record of stepping out of his high party official's cocoon to contact dissidents." It was the purest KGB disinformation, but we so wanted it to be true. Andrew Young called the Ayatollah Khomeini a "saint." George McGovern compared Ho Chi Minh to George Washington. And Hillary Clinton described Bashar al-Assad as a "reformer." Crown Prince Mohammed has made reformist noises; it's true. But the arrests and convictions of peaceful protestors have not abated. If anything, they've increased. On Oct. 28, Israa al-Ghomgham, a female Shiite activist faces trial and possible execution. Human Rights Watch says the charges against her are not recognizable as crimes. According to the Guardian, the charges include "participating in protests, chanting slogans hostile to the regime, attempting to inflame public opinion and filming protests and publishing on social media." The crown prince seems to have hair trigger about criticism from abroad as well. When Canada's foreign minister tweeted out a call for the Saudi monarchy to release two jailed dissidents, the crown prince went to Defcon 4. He cut all ties with Canada, ordered all Saudi students home from Canadian universities, and expelled the ambassador. Sometimes you have to deal with bad actors on the world stage. But you don't have to delude yourself about who and what they are.